Why Invest in Domain Names? Blog Why Invest in Domain Names? 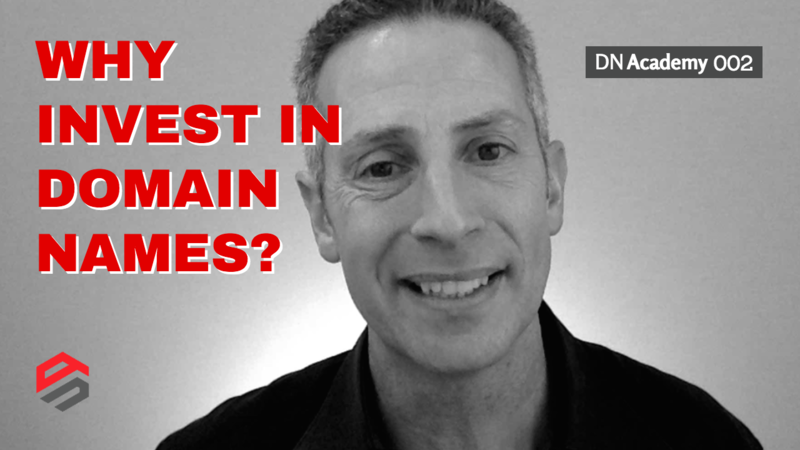 Here are 10 reasons why you should be investing in domain names. 1. Internet Growth: The internet is large and growing. Worldwide retail ecommerce sales will reach almost $2 trillion in 2016 and it’s projected to grow by double-digits through 2020, where sales are expected to top $4 trillion. Now, while total retail sales in 2016 are expected to reach $22 trillion, 9% of all retail sales in 2016 growing to 18% by 2020 is a trend that we cannot ignore. And domain names are where that ecommerce is happening. 2. Limited Supply, Massive Demand: A premium domain name is like prime real estate — they’re in limited supply, many people or companies would love to own them, and they’ll maintain their value over time. Think about it. If you ran an online casino, would you rather own PokerNow.com or Poker.com? PokerNow.com is going to take you millions of dollars to promote and brand, while Poker.com is going to be top-of-mind immediately from your customers, likely have type-in traffic, and will be an asset that always maintains it’s value. 3. Capital Appreciation: Good domains appreciate over time, like land in a desirable location. A friend of mine bought a piece of property with a tear-down house in Beverly Hills, California, about 10 years ago. I couldn’t believe it when he paid $750,000 for the property, when he knew the house was unlivable in it’s then-current state. It would take another $1 million to build a house, so he would be in it for $1.75 million at the start of his investment. But he knew that land appreciates over time and there was scarcity in that part of Los Angeles, where everyone wanted to be and where the public school system was great. Fast forward 10 years and in addition to being able to rent out his house for more than $10,000 per month — you heard me right, more than $10,000 per month — he recently sold it for $4 million. On DomainSherpa, I host a series of shows called Profitable Flips where domain name investors see where appreciation can happen and invest their dollars. I’ve seen domain name purchases that have phenomenal ROIs: an $81 purchase lead to a $12,500 sale, a $99 purchase lead to a $9,000 sale, and a $1,500 purchase lead to a $20,000 sale. I’ve personally had a low five figure purchase lead to a low six figure sale. And, I’ve turned down a mid five figure purchase of a two-letter domain name that today would easily be worth seven figures. Yes, hindsight is 20-20. 4. Minimal Holding Costs: With physical real estate, you have to maintain the property. That might include landscaping, maintenance, repair and monitoring the property to ensure there’s no undesirable use of it. With domain names, you only have to pay your yearly renewal fee, which is about $10 per year. No one can use your asset because you control the DNS of your domain name — where it resolves and who can send email. 5. No Taxes, Insurance: With domain names, there are no taxes or insurance to pay. Unlike physical real estate where you have to pay taxes to the city based it’s the location and valuation, with domain names you pay no yearly taxes to own the property. And there are no insurance requirements. No one can trespass on your domain name, for example, break their leg and sue you. 6. Domain Name Leasing: You can lease a great domain name like you do with physical real estate. With physical real estate rentals, the owner of the property always has to deal with the 3 Ts: tenants, toilets and taxes. While the returns can be good, you always have headaches. With leasing domain names, you maintain control of the domain name and simply allow the website address and email address to be used by the lessee. And as long as the monthly rent is received, the lessee has use of the domain name. 7. Domain Name Parking: In some cases, premium domain names will have natural type-in traffic — which means real people are typing the domain name into their browser to see what’s there, buy a product, or search for a service. There are companies that easily allow you to display advertisements which generate revenue if the user clicks on them. It’s not uncommon to make tens to hundreds of dollars — in some cases thousands of dollars — per month from that traffic, without having to build a site, maintain a single line of code, or ever worry about having to upgrade your technology. 8. Upside Potential: In addition to the option of simply selling a domain name for capital appreciation, you can also potentially sell a great domain name for cash and stock. Rick Schwartz, a well-known and long-time domain name investor, has many times sold a domain name and taken a small piece of the company — like he did with Candy.com and Bobbleheads.com — which gives him both cash on closing and upside when the company grows, generates a profit, and potentially sells someday. 9. Hustle = $: Companies inherently have baggage. They have bureaucracy, move slower, and require multiple levels of approvals. Individual investors, on the other hand, can move faster than companies, and can often accept more risk when it comes to speculation. For example, unless a company has decided on the name of a new product or business line, they are not going to invest in a premium domain name. But if that asset can be purchased for a fraction of what multiple companies may pay for it, then that’s a smart, long-term investment that an individual investor may bet on. It’s no different than doing your research on a company that’s about to take off, buying the stock while it’s low, and then selling it to other investors who want to get in later. Yes, it’s speculative, but it’s also less risky than a lot of other investment opportunities if you’re smart about it. 10. Unlimited Opportunity: Even through the most expensive domain name sales of all time — with the top 20 each selling for more than $5 million — are all in established industries like gambling, travel, investing and the like, in the next 20 years to come a whole new wave of innovation will provide an opportunity for newer investors to make their mark and have their sale be in the top 20 or 100 domain names of all time. Just think about what’s new today that didn’t exist when the internet was commercialized in 1995. Drones, virtual reality, autonomous-driving cars, the list is endless and continues to evolve every day. Innovation never stops. And that’s an opportunity for domain name investors. BONUS: The people. Finally, after all the others reasons, I always come back to the people. Once you actually get into domain name investing, understand where to find deals, how to buy low and sell high, you understand who you can trust, who you can lean on, and who you can ask for advice. There’s a camaraderie amongst the small group of investors around the world that understand this asset class. They support each other, provide guidance, and a helping hand when needed. It’s a great industry. The way I see things….. There are many more “Domain Gamblers” and “Domain Flippers” and “Domain Brokers” than actual “Domain Investors”. Serious and professional full time “Domain Investors” are the smallest group by far. We’re in full agreement about being a professional investor versus a hobbyist or gambler. It is my friend Warren Royal that owns Bobbledheads.com and then also Bobblehead.com and is now the largest bobblehaed manufacturer in the world. He was never in the business until he bought the doman and eventually bought out his largest competitor that had been in business for a very long time. Now only that, Warren is a really nice guy! He is a professional doman investor. Thanks for the correction, Rick. Great article, as always Michael. Thanks, Fatih. I appreciate you watching and taking a moment to post a comment. That ‘s a dam good read!! Its more speculation than investing. Loved the Rick/Michael/Page sherpa news vlogs. Any left up? Not if you’re doing it right, Garth. Unfortunately, I have to remove shows when a specific person is deemed not trustworthy. It may do more harm than good to leave the show available for viewing. Many of the shows that Rick, Mike Berkens and Page were on are an unfortunate outcome of this situation. I will try to create excerpts from them and air them in the future. Lending institutions (banks) do not acknowledge these digital assets yet, that’s my yardstick of normalized investing. We are still in the infancy 20 years in. Probably a lesson for us all, not to rely on one person as a go to. While that is true, Domain Capital has existed for more than 10 years providing financing with domains acting as the asset. I just completed an interview with Vince Harasymiak of Domain Capital that should air on DomainSherpa.com in a couple of weeks if you’re interested in learning more. Thanks for sharing and nice writeup! The future for domain names are going to get better with each passing days. It’s more like a bank for future, save some and sell them at later, people can just become rich in a matter of minutes. It’s all about having a great domain name at hand. Great domain names are what makes the difference. It’s amazing how many type-ins and inquiries a great, premium domain name receives. I would not go this far –> “people can just become rich in a matter of minutes”. It takes dedication, knowledge and patience to successfully invest in domain names. While I feature people selling domains on DomainSherpa (http://www.domainsherpa.com/flips/) that they bought for a fraction of the sales price, buying the right types of domains is critically important. Thanks for watching and commenting, Ron. Great video and write up Michael. Thanks for sharing. Thank you, Jason. Happy holidays. to earn thousands of dollars a month from a parked domain an investor buying right now would need to pay millions for the domain. It’s convenient for investors to make statements like that, but I don’t think it’s true in all cases. For example, before I started investing in domain names, I ran multiple publishing websites. I closed down a few of them as they were not generating any income. I *almost* allowed the domains to expire and drop, but instead I decided to park them. Since then, they’ve been earning more than a hundred dollars a month…just the four domains that I almost let drop. I have no doubt that buying other domain names that are not earning any revenue but have traffic will lead to income. The key is buying under-appreciated assets, like any type of investing. That’s my data that supports my opinion. I’m open to hearing your data that supports your opinion. Have a Fantastic 2017 New Year and do great !!! My pleasure, Pat. Thanks for watching and taking a moment to post a comment. Nice article and I fully agree with it. Domain name of any website is the first depiction of what your site says! Choosing a domain name is not the work of rushing, one should do a research and take his time to think about all the precepts intensely. There is a reason why people go after certain keywords for domains, because it works!